Jackie Kennedy once said, "I want to live my life, not document it." While I think the documenting is very important, the living always, always takes priority. That's been a difficult lesson for me. I first realized it with my camera. You miss a lot of the action when you watch it behind a lens. It took me a while, but I finally learned my lesson. If you missed, my posts over the last few days, I appreciate the support, but once you realize where I've BEEN and what I've been DOING I think you'll understand. The remarkable weekend started off with a bang! Central Catholic beat St. Mary's in the Annual HOLY BOWL! This is CC's first victory since 2009 (Steel's junior year.) I didn't attend but I heard it was a great game. I know my husband was thrilled. He was very proud of those boys. When Leroy asks for a picture, you know it's a significant occasion. Here he is pictured with Varsity Quarterback Garrett Ardis (one of Leroy's favorite people) the Coach and of course the Holy Bowl trophy which will be prominently displayed at CCHS for the next year. We met up with the Almiedas and headed straight for California Adventure. 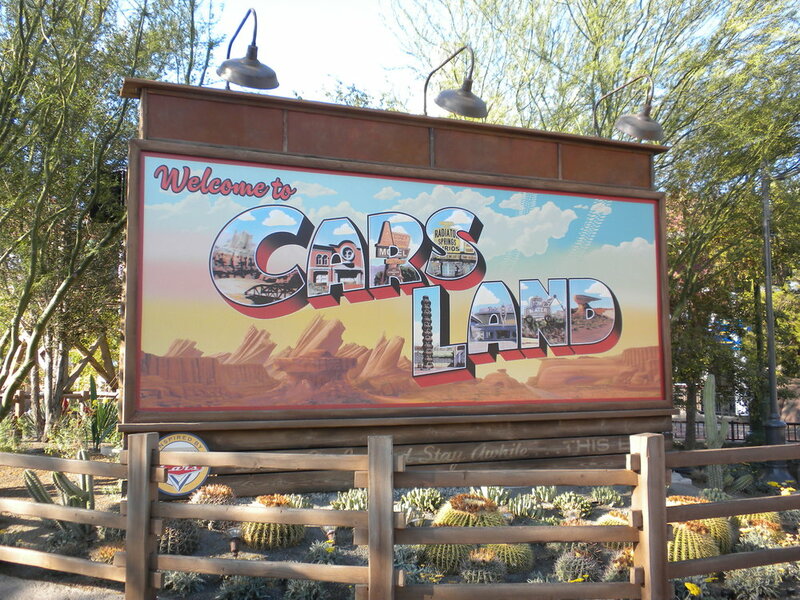 We've been anxiously awaiting a visit to the park to see the new Cars Land and experience Radiator Springs for ourselves. It did not disappoint. It was awesome! The look and feel of the whole area puts you right in the movie. 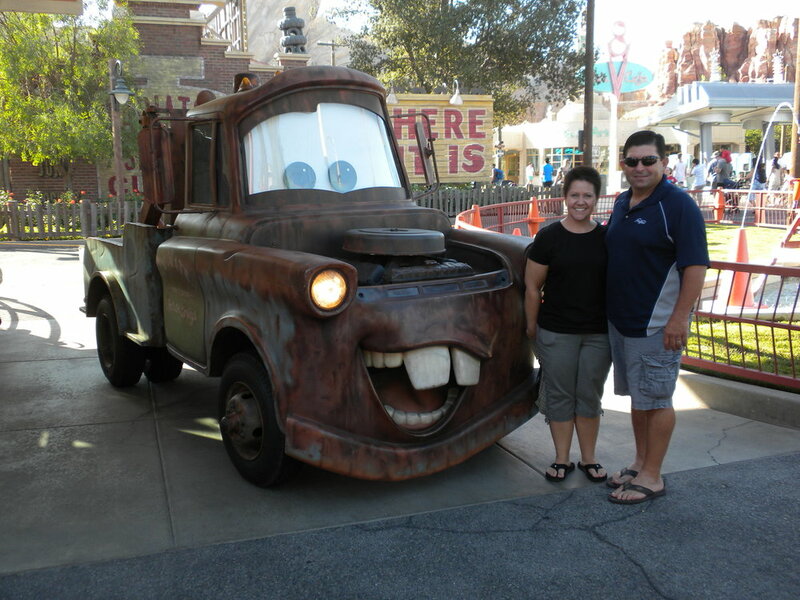 We spent the rest of the day in California Adventure and took advantage of the unusual low attendance. We did nap in the afternoon, but headed back to California Adventure to see Radiator Springs at night (can't miss the neon) and then to Disneyland to see the fireworks. While the fireworks are my favorite "show" they always make me a bit sentimental. I was struck by how much I missed Steel. Being in the park with Sierra was great, but I miss those times when we were ALL together. I think that's what I'll ask for as a birthday present next year. Sunday morning, back at the park. As it is the month of September, we are (constantly) celebrating Anne's birthday. It was difficult, but I did manage to convince everyone to pause for a moment in front of the iconic castle for a group shot. 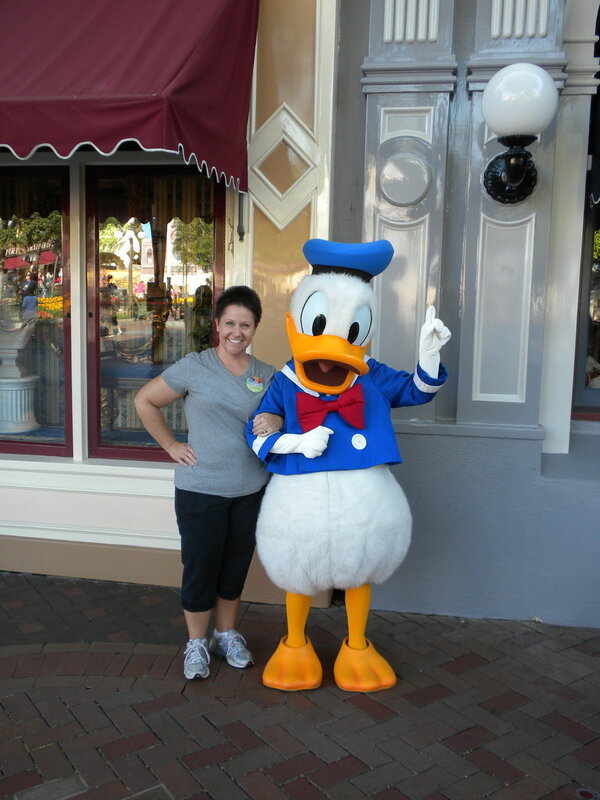 We also had photo ops with Donald (my favorite character) and the main man himself, Mickey Mouse! WOW! I'm worn out just writing this blog. 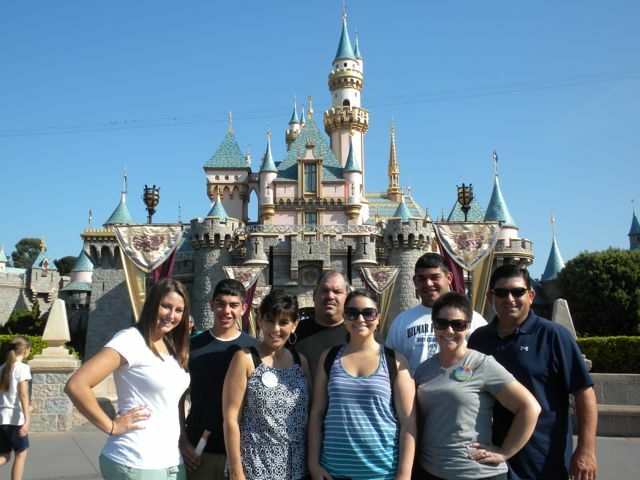 While I'll admit that I can't do the "quick trip" like I used to, I hope I NEVER turn down a chance to go to Disneyland. Even through the exhaustion of the schedule (and the stress of the new contacts) we had a great time. But I will admit that whenever we had a chance to rest, that's exactly what we did. In the evenings I was just too tired to write which was alright with me, considering the company I was keeping in the Happiest Place on Earth. Needless to say, the grace was abundant and I didn't want to miss a minute of it. I'm back on track now and basking in the glow of wonderful memories. Thank you for understanding!